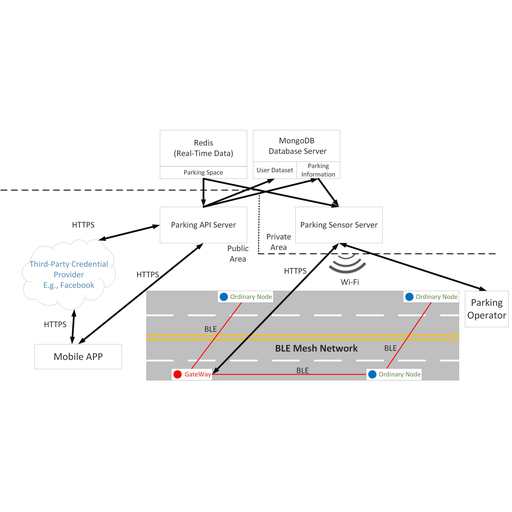 In this paper, we propose an Internet of Things (IoT) parking management solution for roadside parking spaces. This solution includes software and sensor hardware installed at each parking space. Because the smartphone is prevalent nowadays, we also design a smartphone application to enable users to easily access information regarding parking spaces near the user’s destination and devise the best path to it anytime, anywhere. We choose Apple iOS as the programming platform on the smartphone and Raspberry Pi 3 as the sensor hardware, which uses an infrared distance sensor to determine whether the parking space has been occupied by a vehicle or not. We also adopt Bluetooth Low Energy (BLE) technology to connect sensors of all roadside parking lots and build a BLE mesh sensor network to collect parking statuses. A routing protocol for the BLE mesh sensor network to efficiently forward parking information to the parking management server is proposed in this paper. Finally, we present the software and sensor hardware used for implementing this parking management system, the simulator to execute the proposed BLE mesh routing algorithm, and snapshots of the parking app. Ing-Chau Chang, Peng-Jun Hsu, Yuan-Sheng Lin, Yu-Sheng Wu, Pin-Lin Chen, Xian-Feng Lin, and Chin-En Yen, Design and Implementation of an Internet-of-Things Roadside Parking System Based on Raspberry Pi 3 and Bluetooth Low Energy Mesh Sensor Network, Sens. Mater., Vol. 31, No. 2, 2019, p. 365-376.